These days, Amoruso knows a lot about being on top of the chain. She began her clothing company Nasty Gal as an eBay store; in the beginning, the clothing store’s main form of advertising was friending hip-looking girls on MySpace. In an impressive vintage rags-to-riches story, she’s now worth an estimated $250 million and celebrated as a #GIRLBOSS icon, as that insistently hashtagged memoir puts it. The company has become synonymous with a certain type of young, hip, rebellious, skintight style, equal parts rock club chic and boho hippie festival. (There are a lot of crop tops and teeny-tiny lace dresses.) The formula works: they have a lavish downtown Los Angeles headquarters, millions in venture capital funding, and, for Amoruso, a white Porsche that she paid for in cash. It’s a nice image, and it’s clearly worked wonders for Amoruso. But several former employees—some of them people who’d been deeply devoted to the company—say that Amoruso’s personal success hasn’t been quite so wondrous for everyone working below her. Nasty Gal’s profitability, these former employees say, has come at an extraordinary cost to people who have worked there. As the company has grown at an astronomical speed, former employees allege that Amoruso has increasingly delegated everything about how Nasty Gal runs to new CEO Sheree Waterson, first hired in 2014 as president and “chief product officer” for the company. It’s Waterson, they say, who’s forced a series of layoffs and “reorganizations” that have made employees furious, frightened, and, eventually, led many of them to quit—about 30 people in 2014 alone, by one source’s estimate—many of them in a two-month period. As Amoruso embarked on her book tour last fall, the company had its third round of layoffs. Insiders say many, many more quit soon after, and continue to stream out in droves, sick of the company’s dysfunction. In interviews with Jezebel, eight former employees, some of whom departed quite recently, described a place that besides the three rounds of mass layoffs in the last year alone, besides losing many of its most devoted employees, has shed all of the perks that made it such a sought-after job: free lunches, snacks, micro-brew coffee, wine nights, the “team-building” trips to Disneyland. They say the atmosphere is increasingly poisonous and the company’s brand muddled, as bigwigs from places like JC Penney and Urban Outfitters and Barney’s start coming in and pulling the company in every direction. 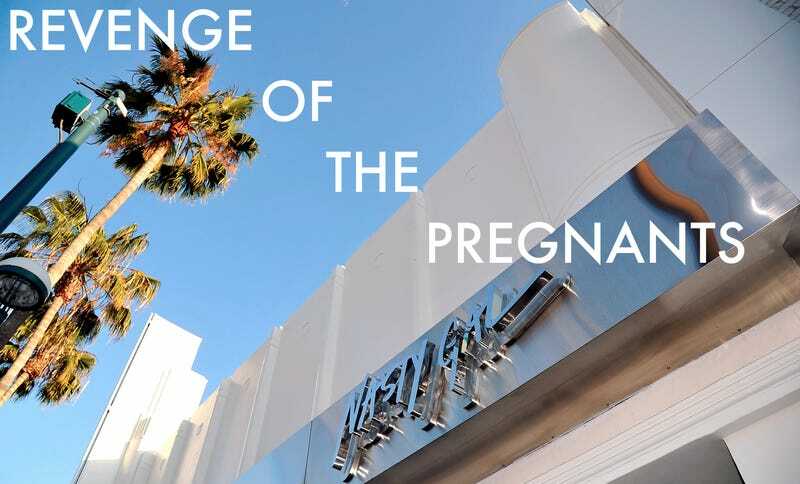 Adding to the company’s toxicity, two lawsuits alleges that Nasty Gal fired multiple pregnant employees either before or during their parental leave, and an employee with a serious illness who was awaiting an organ transplant. I am very proud to represent these three brave women, who had their careers derailed by Nasty Gal. Unfortunately, Nasty Gal forces its employees to sign arbitration agreements – depriving them of a jury trial, requiring that their cases be decided by an arbitrator paid for by Nasty Gal, and making the entire arbitration completely confidential. These days, employers are getting much smarter and roping employees into “restructurings” and saying that they lost their job. But knowing the facts of these three remarkable women, how they were the only pregnant females who provided notice of maternity leave before being terminated, and how their jobs were taken over by other employees, I knew these were cases I had to take and fight to make sure other pregnant womentrying to already juggle so much are not catapulted back to the “Mad Men” era of being asked to leave work when their employer learns they are pregnant. And there’s Nasty Gal’s former accountant Farah Saberi, who, as Buzzfeed was first to report, says she was laid off while suffering from advanced kidney failure. In a lawsuit that will soon enter arbitration, Saberi says she was first diagnosed with end-stage renal failure in 2013, and soon discovered she would need both a kidney and pancreas transplant. She also underwent bypass surgery to correct a blocked artery in her heart. In August 2014, she was laid off due to “elimination of her role,” and, she alleges, was offered a severance agreement in which she gave up her right to sue, in exchange for six months of healthcare and two weeks’ pay. Saberi alleges that the company let her healthcare coverage lapse anyway, in violation of the agreement. She was unable to afford her blood pressure medication. Her brain became swollen, and in January, she suffered a grand mal seizure in traffic. She still needed the kidney transplant, but because her insurance lapsed, a hold was placed on the process. In April 2015, when the lawsuit was filed, she was still hospitalized, watching as her bills zoomed up astronomically. Her lawyer says she still hasn’t gotten a new kidney. Her lawsuit accuses the company of violating California’s Fair Housing and Employment act, saying Nasty Gal illegally discriminated against her because of a physical disability. Among other things, she’s suing for emotional distress, negligence, and breach of contract. Few workplaces are entirely bad or entirely good, and Jezebel made a sincere effort to chase down Nasty Gal employees with positive experiences working at the company. The ones currently employed who we were able to contact did not respond to requests for comment, and the ones who spoke with us said they had nothing positive to say. None of the former Nasty Gal-ers would allow their names to be used in this story, saying they feared retribution from Amoruso or Waterson. Some of you may have seen publicity today around the restructuring at Nasty Gal that took place over nine months ago. The accusations and the articles are completely without merit and we are responding appropriately and defending the claims. I understand that certain reporters have attempted to contact some of you for comment— please direct all inquiries to Press@nastygal.com. As a reminder, employees are not authorized to speak on behalf of Nasty Gal unless coordinated with our internal PR team. Nasty Gal’s staggering success story has been outlined in a number of glowing features ( “If ever there were a Cinderella of tech, Sophia Amoruso might be it,” the New York Times raved, back in 2013.) To make the fairy tale a little shorter: the company began its astronomical growth in 2011, when Amoruso and her first employee, buying director Christina Ferrucci, moved with 11 other people from San Francisco to Los Angeles. In the first year, they hired close to 100 people. The longtime employees say that while Waterson is deeply intelligent, she has little sense of what made Nasty Gal so successful. Several former employees say that Waterson’s focus is on raising the Average Unit Retail (AUR), the average cost of an item in the store, even though a cornerstone of the business has always been inexpensive clothing. The AUR at Nasty Gal is now around $100, the former employees say, which is the highest it’s ever been, and up by 50% from this time last year. The sales volume, they say, has plummeted 40% at the same time. Waterson, who is 58, reportedly blamed that on “inexperienced merchants,” but one former employee says the real problem was that she pushed styles she personally liked without paying attention to what actually sold. Sheree prevented anyone from doing any real work by keeping us in 3-5 hour meetings where she would tear down all the products on the site, which was literally based on nothing but her own 58 year old opinion. Even when people presented her with legit selling data on items she deemed irrelevant, she would brush it off and push the merchants to invest in styles that she personally liked. She would show up late to meetings (or leave after 10 minutes), talk for about an hour about nothing in particular, and then comment about how terrible everything looked. At the same time, the former employees all agree, Amoruso was increasingly absent, writing #GIRLBOSS, starting the #Girlboss Foundation, a laudable organization that provides grant funding to up-and-coming female entrepreneurs, and going on her book tour. One describes her as “barely present,” saying when she did show up for meetings, she was buried in her phone and seemed unfamiliar with anything about the company’s finances, numbers, processes, or even the most basic merchandising terms. She probably actually addressed me directly 5 times. She never made any effort to actually connect with her employees. If she wasn’t out doing press or interviews, she would be locked in her office; there was no visibility or sense of presence. Especially when #GIRLBOSS came out and her ego exploded, she began acting like a celebrity not a CEO. There were so many directors and executives who would share that her head had grown so large, it was impossible to work with her. After the last batch of firings, the employees who were left say they wept openly in a meeting as Amoruso described aloud why their friends didn’t fit the company values. Everything really hit rock bottom with the layoffs. It was a rough day. To my understanding the managers weren’t even aware until the morning of when Sheree forced them to fire team members due to “reorg”. Some departments where dissolved, but other layoffs seemed very strange—despite the fact that they were presented as re-organization, these eliminated positions where filled with new, outside hires a month or two later. People started to get pissed. We were a close family. Friends. We watched people’s lives get ruined for no reason. The morale was so low that Sophia and Sheree brought in a consulting company called Nobel. They have worked with HUGE companies, so I assume they couldn’t have been cheap. They stayed with us for three months, listened to complainants, told us they were a safe place to air our grievances, and tried to implement new processes (especially in our epically unproductive meetings). All of the “processes” that they paid Nobel to teach us were never adopted or enforced. It was a hilarious waste of time, money and energy. A short while later, three of her longest-serving and most loyal employees were also let go, including Christina Ferrucci, described by several people as “Employee #1” and the person who suggested Nasty Gal start selling new clothing, now a huge part of its business model. People who were present at these meetings say that Amoruso described Ferrucci and the other employees as having been let go for “being mean girls.” Other employees dispute her take. In the end, the former employees occasionally seem angry about their time at Nasty Gal and what the company became. Mostly, though, they seem deeply sad. And the company’s still hiring. Though their 2012 influx of cash arguably led to unsustainable company spending that resulted in layoffs axing more than 10 percent of the company’s staff people by the end of last year, Nasty Gal may be on another upswing powered by investor money: according to a recent Instagram post from the company’s “Talent Aquisition Manager” Iris Hanu, they appear to be recruiting in San Francisco. Nasty Gal is still attractive to hip young women wanting to work in fashion, but another ex-employee says it’s important to be aware what they’re getting into. Correction: An earlier version of this story said the first Nasty Gal store was opened in Melrose — it was opened on Melrose Avenue in West Hollywood. I regret the error.